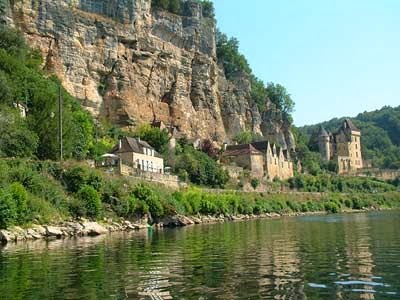 Rick and I visited the Dordogne in the mid-1980’s and I had always wanted to return. The Dordogne is farming country and those gorgeous vegetable gardens were every bit as beautiful as I remembered. And yes, a row of lettuce can be heartbreakingly beautiful. This time, in a concession to old age, we did not go hiking. Also, instead of re-visiting the magical cave at Font de Gaume which required navigating steep steps, we went to the senior friendly cave Rouffignac where we rode around in a little electric train deep into the bowels of the earth to see wall paintings from 40,000 years ago. We appreciated the train, but the paintings seemed less magical than they had decades ago. I think it was more enthralling the first time because it was such a surprise. I knew a little about the cave art but had never seen it and was stunned by the astonishing skill of the painters. This time I was prepared for the artistry and as a consequence was less moved by the experience--less moved than I was decades ago, perhaps, but deeply affected nonetheless. We took leisurely walks around the old medieval towns of Perigueux and Sarlat. 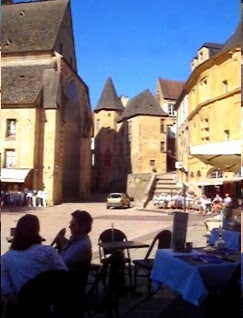 Sarlat is especially magical with all the buildings made of gorgeous golden stone—dazzling on a sunny day. 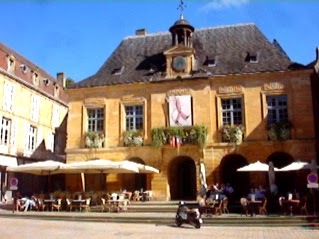 When we were in Sarlat in the summer in the mid-1980's, the square was thronged with tourists and street musicians. The atmosphere was so much more festive. I enjoyed the tranquility of October but missed the festivity of high summer. Trade-offs, trade-offs. In addition to revisiting beloved towns we went to the Museum of Prehistory which was not open when we were there in the mid-1980’s. 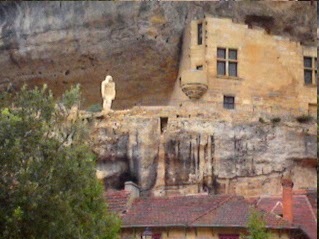 The museum is amazing for the building carved into the steep cliffs above Eyzies-de-Tayac. However, the exhibits were more for the specialist than for the tourist and I enjoyed the site much more than the exhibits. Also, we visited the amazing gardens of the Manoir d”Erignac which were not open to the public when we were there last time. 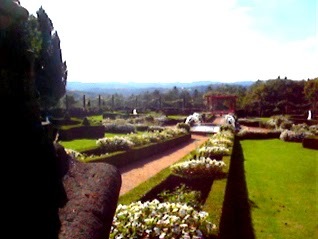 We spent almost an entire day wandering around the gardens--our senior citizen “slow travel.” We see far fewer towns, historic sites, museums etc., but what we see, we really savor. 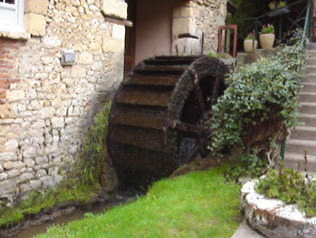 Thanks to Rick’s research, we discovered a wonderful and very affordable hotel, Hotel du Moulin de la Beune in Eyzies-de-Tayac. 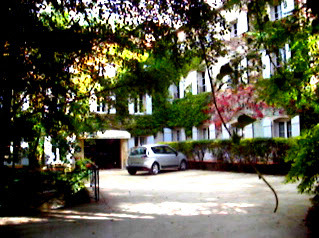 It was a 2 star hotel--no flat screen TV, no minibar in the room, spotty internet etc. -- but it couldn’t have been more charming. 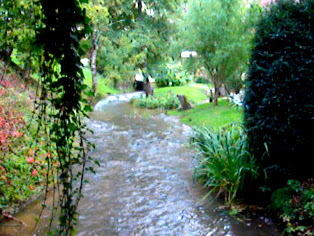 A babbling brook ran through the property and there really was an old mill. Best of all, it had a seriously good restaurant—-first rate French country cooking at affordable prices. We had dinner there every night. At this stage in our lives we really enjoy having dinner at our hotel. We are a lot more careful about drinking and driving than we were in the days when our reflexes were far better. Having dinner at the hotel means we can indulge in a bottle of wine and after dinner drink and not worry. This hotel was probably the best in terms of good value that we’ve stayed in all our years of traveling in France. We probably won’t make it back to the beautiful Dordogne. At this stage in life there are just so many return trips we can make, but I’m very happy to have visited the Dordogne again. Philly Voter Turn-out: How low can it go?